Proud of what you’ve done using Light-O-Rama technology? You should be! Share with the world what you have created for Christmas 2017 and you might win a prize from Light-O-Rama. Say hello to our 2017 Christmas Contest! To make it even easier to win, we have two contests for 2017. Categories 2-9 must be sequenced exclusively using Light-O-Rama software and must be predominantly controlled using Light-O-Rama hardware. .
Strong Suggestion: Check your video link to make sure it’s active and plays back as you desire before submitting your entry to this contest. Please make sure your video stays posted through March 31, 2018. Entries must be received no later than January 21, 2018 at 11:59pm, EST. 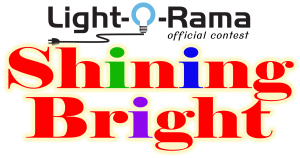 By entering the Light-O-Rama Christmas Contest 2017 you agree that video of your display may be added to the Light-O-Rama website and used in any of our materials. Please include what information (if any) you want included with your video (your name, town, a write-up about your display.) Once your entry form is submitted, changes are not allowed. Each entry submitted for this Share the Show 2017 contest must be a unique video. If you have two entries rather than one then you double your chances to win. 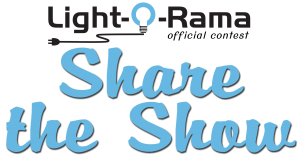 By entering the Light-O-Rama Share the Show Contest 2017 you agree that videos of your display may be added to the Light-O-Rama website. Please include what information (if any) you want included with your video (your name, town, a write-up about your display.) Once your entry form is submitted, changes are not allowed.